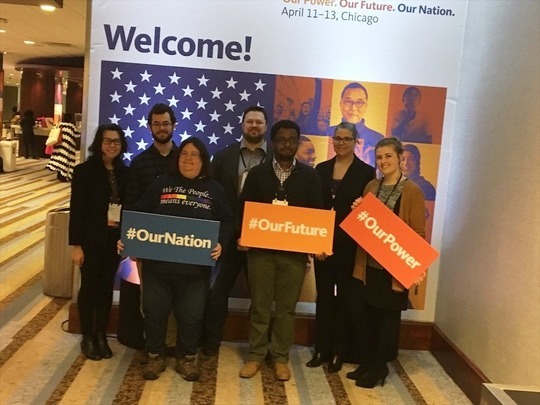 From April 11-13, the City of Minneapolis, including the Minneapolis Promise Zone (MPZ) team, participated in Policy Link's 2018 Equity Summit in Chicago, IL. The conference, which drew over 4,000 attendees from all over the country, directly aligns with the MPZ’s top goal: increasing racial equity. In fact, the MPZ is the only one of the 22 Promise Zones across the nation with a stated racial equity goal. In addition to City Equity and MPZ teams, City Council members were in attendance along with other City representatives from Community and Economic Development Planning, Intergovernmental Relations, Innovation Team, The Resilience in Communities After Stress & Trauma (ReCAST), and more. The City’s strong showing represents an enterprise-wide commitment to learning and implementing equitable policies both organizationally and City-wide. This year's Equity Summit was divided into three main workshop series: Equitable Economy, Healthy Communities of Opportunity, and Just Society. Each of the workshop series included around fifteen large sessions, with a panel of about four people, participants could choose from to attend. One of the Equitable Development workshops, Housing Development Without Displacement, covered topics like: 'people-driven alternative' housing models and strategic community-centered public-private partnerships. Some of the ideas taken away from the Summit included a lesson from the organization, City Life/Vida Urbana, which focuses on the significant role Community Land Trusts (CLTs) play in preventing displacement of low-to-moderate-income people of color in Jamaica Plain, a neighborhood of Boston, MA. Dudley Neighbors Inc., created the CLT mentioned above in 1988, they now own 30 acres of land with 226 units of affordable housing. City Life/Vida Urbana is also a member of the Right to the City Alliance, which recently released a report detailing similar 'people-driven alternative' housing models like Community Land Trusts called, Communities over Commodities. Ron Sims, former Deputy Secretary, U.S. Department of Housing and Urban Development (HUD), concentrated on the responsibility of the Federal government to leverage their influence and convince developers to include a significant number of affordable housing units for lower income households. The final workshop series, Healthy Communities of Opportunity, included a workshop discussing the importance of place-based, or collective impact, initiatives, where the goal is to funnel streams of resources to neighborhoods of concentrated poverty, which are often racially segregated. The Promise Zone initiative, led by the City of Minneapolis and HUD, is one of several place-based Federal-local initiatives. The MPZ team works to bring additional Federal dollars into North Minneapolis while concurrently pursuing local policy education and change for partners, stakeholders, and community members working on issues, such as economic development, that are critical to increasing racial equity via more and better jobs, housing, and health. Knock out all of the Core Four courses at Business Research Boot Camp. In this month-long series you will meet once a week to learn about industry, company, market and funding research in an accelerated 90-minute classroom setting. Classes are instructional and include expanded time for Q&A. On June 30th Minneapolis became the 40th jursidiction to enact a minimum wage ordinance to increase the minimum wage over the next 5 years. This ordinance will incrementally raise the city's minimum wage to $15 an hour, by 2022 for large businesses and by 2024 for small businesses. In the WAGE$ study, we will evaluate how this increase in the local minimum wage affects the health and wellness of Minneapolis minimum-wage workers over 5 years. Evaluating this "upstream" policy is critical in moving forward the conversation about wages and health, especially as it relates to health equity. This natural experiment involves two cities: Minneapolis, Minnesota and Raleigh, North Carolina (comparison site) and is funded by the National Institute of Diabetes and Digestive and Kidney Diseases (NIDDK). April 17: 12:00 p.m. - 2:00 p.m.
April 25: 10:00 a.m. - 12:00 p.m.
May 2: 1:00 p.m. - 3:00 p.m.
For more information contact: Amy McCarthy: amy.mccarthy@minneapolis.edu, 612.659.6313. Northside Fresh Quarter 2 Meeting! Thur, May 24, 5:30-7:30 p.m.